“Just one, sir: with those giant sat dishes Miller uses for ears, there’s no need for us to actually dock, is there? He can just conduct an audio scan from here,” said Mudunuri. The other squad members laughed as Miller, the pilot, whipped his head around to shoot Mudunuri a scathing look. Miller shook his head from the cockpit. The other soldiers sniggered. “Raider-1 this is Barack actual, we read you. Coms are go, over,” said a voice over the open channel. “Coms are go,” they all said in unison. Over her shoulder, Blackwelder could see several lights flash green on Abernathy’s console. “Coms are go, Lieutenant,” Abernathy said to Macke with a wink. Raider-1 was a small ship with cramped quarters. There was a cargo hold beneath the floor of the ship, but its capacity was limited, not that they were expecting much of a physical salvage. Four soldiers shared the seating compartment with Blackwelder. Macke stood over the backs of the pilot and Abernathy, talking navigational tactics. They sat close together, their knees touching and occasionally banging into one another as the ship jostled. Several lit panels—some with loose-hanging cables—beeped above their heads. Expecting the atmosphere aboard the Elumerian ship to be completely inhospitable, the Allied Earth soldiers were wearing their space suits, sans helmets, and held their heavy-duty laser rifles at the ready. The air was rife with tension; they had joked before, but Blackwelder knew it was a weak ploy to cover their mounting fear. None of them had ever stepped foot onto an alien, enemy vessel before. Blackwelder felt the concern himself, of course, but had to master it. Macke might have been the one giving the orders, but Blackwelder knew he’d be the one to keep them on point. “Don’t forget to breathe, Jinx,” Blackwelder said to them all. “This is nothing more than a standard recon mission. You’ve trained for this.” A couple of them nodded, but they seemed little put at ease by his words. He took a quick look at Macke, though the lieutenant didn’t turn to meet his glance. A couple of them chuckled at the comment. “But what if you like veg-ox?” one of them said softly. “Shut up, DeFrank,” Mudunuri said. “Target in range, LT. Better get strapped in,” Miller said. On screen, Blackwelder could see a massive vessel that was rounded and bulbous on one end and through the middle, but that tapered off toward the tail. Cascading rows of spikes adorned the middle of the craft on both sides. The spikes, rounded at the edge and faintly glowing from their center, could almost be mistaken for fins. In fact, the whole ship had the look of a mutated whale, which reminded Blackwelder of the aquatic life they’d discovered years ago in some of Earth’s more polluted oceans. Macke nodded and turned to take his seat, the only available one being next to Blackwelder. Blackwelder looked up at Macke; he kept his expression blank, but inside he was laughing. He could see a moment of nervousness sweep over Macke’s face, but he mastered it immediately and took his seat. Blackwelder couldn’t help himself; he found Macke’s discomfort utterly amusing. Raider-1 docked with the Elumerian ship shortly thereafter. Macke glanced at Abernathy, who was close enough to overhear them. Her expression was quizzical, as she too seemed to be confused by the sudden change in the lineup. Christopher D. J. was born and raised in the South, calling multiple cities home between North Carolina, South Carolina, and Florida, but none more so than Daytona Beach, where he graduated from Mainland High School. Christopher went on to complete his BA at Duke University and his MPW at the University of Southern California. 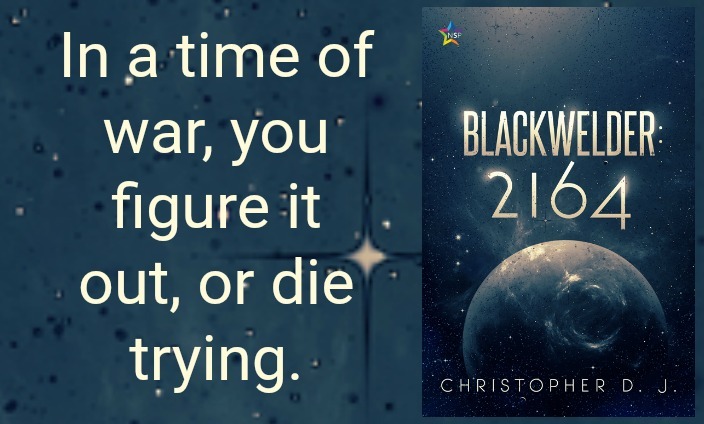 Christopher is the author of Blackwelder: 2164 and Between Two Brothers. He briefly worked in the entertainment industry before turning his attention full-time to higher education; he currently has the pleasure of serving first-year students and families at California State University, Los Angeles as the Assistant Director for New Student and Parent Programs. Christopher lives in Los Angeles, CA, where he enjoys comic books, movies, cheeseburgers, French fries, and not having to worry about mosquitoes.